Grab a bowl and fill it with water or ice water. If you don’t have ice water readily available, you can always use two or three ice cubes instead. Slice the fennel finely by using a mandoline. If you don’t have a mandoline you can also use a potato slicer but it will take longer. Place the finely sliced fennel in the bowl of (ice) water. 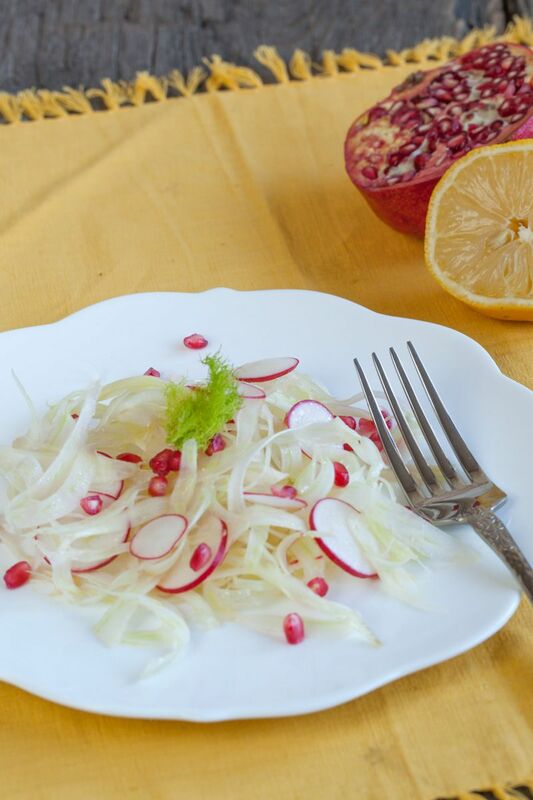 This way the fennel salad will keep its color and actually becomes more crunchy! Add around one tablespoon of fresh lemon juice to the water. Whisk oil with the remaining tablespoon of lemon juice together into a small bowl. This will be the dressing for the fennel salad. Slice the radishes and place into a nice big bowl. 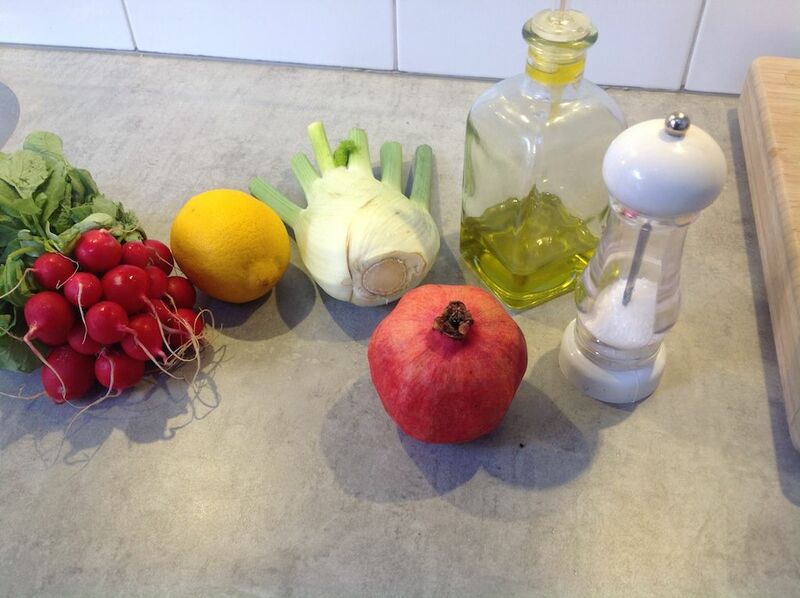 Drain the bowl containing the fennel and mix in with the radishes. Drizzle the olive oil and lemon mixture over the fennel salad and gently toss it. Season with a pinch of salt. 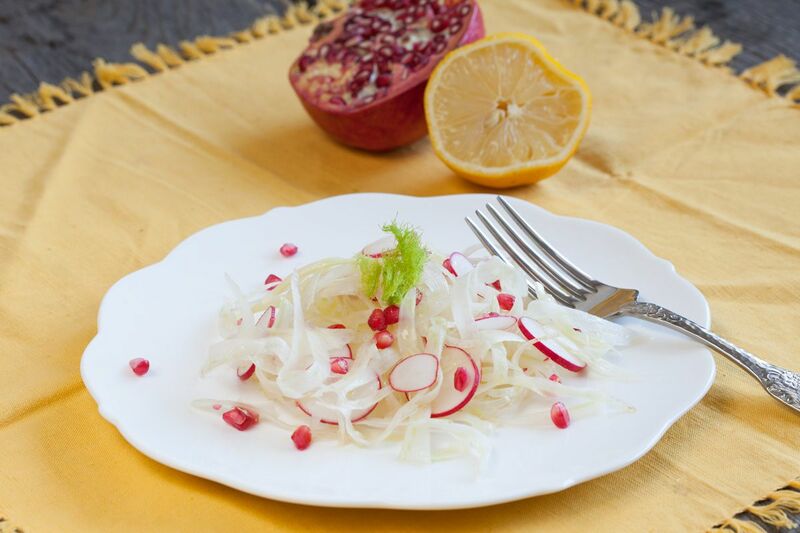 Strew the fennel salad over a nice round plate and scatter some pomegranate seeds on top. This dish is a very light dish to eat and goes great with a nice cold sweet white wine or rose wine. We’ve certainly enjoyed eating this salad and we hope you will too. If so, let us know by leaving a comment through the form below!